A teacher and three children have been killed after a gunman opened fire at Ozar Hatorah Jewish school in the French city of Toulouse. A teenage boy has been also seriously injured. The attacker fled on a scooter, in similar style to the killer of three soldiers in two separate incidents in the same part of France last week. Police say the same .45 calibre gun was used in all three attacks. The search for the killer is now under way. Sources close to the investigation say the number plate of the scooter has now been recovered from CCTV cameras at the entrance to the school. A special service in memory of the victims is taking place at one of the synagogues in Toulouse. There will also be a silent march in Paris at 08:00 p.m.
President Nicolas Sarkozy, who flew to Toulouse, described the attack as a “national tragedy”. He has called for all schools in France to observe a minute’s silence on Tuesday and vowed to hunt down the killer. All candidates in the French presidential election have suspended their campaigns. The grand rabbi of France, Gilles Bernheim said he was “horrified” and “stunned” by what had happened. Israel called on the French authorities “to shed full light on this tragedy and bring the perpetrators to justice”. Monday’s attack happened at around 08:00 a.m., as children and their parents were arriving at the school, in the Jolimont area of the city. Witnesses said the gunman pulled up on a black scooter and began shooting at an area which serves as the drop-off point for the school’s nursery- and primary-age children. “This man alighted from his moped and, as he was outside the school, he shot at everybody who was near him, children or adults. Children were chased right into the school,” local prosecutor Michel Valet told journalists. The gunman is reported to have initially used a 9 mm gun, but when it jammed, he switched to a .45 calibre weapon. A teacher at the school, believed to be aged 30, and his two children, aged three and six, are reported to have been killed. The third child killed was aged between 8 and 10 years old and belonged to another teacher at the school, French media report. A 17-year-old was seriously injured. As the search for the killer got under way, wailing sirens and the sounds of helicopters overhead could be heard throughout the morning. French Prime Minister Francois Fillon has said extra security measures will be put in place at all schools and religious buildings. Some 60 police officers, including anti-terrorist specialists, had already been drafted in to the Toulouse area earlier in the week to help investigate the attacks on the soldiers. A paratrooper out of uniform was shot dead in a residential area of Toulouse just over a week ago, while two soldiers were killed and a third wounded as they used a cash machine in the town of Montauban, some 29 miles (46 km) away, on Thursday. All three – of North African and Caribbean origin – were shot by a man on a scooter. A .45 calibre weapon was also used in the Montauban shootings. 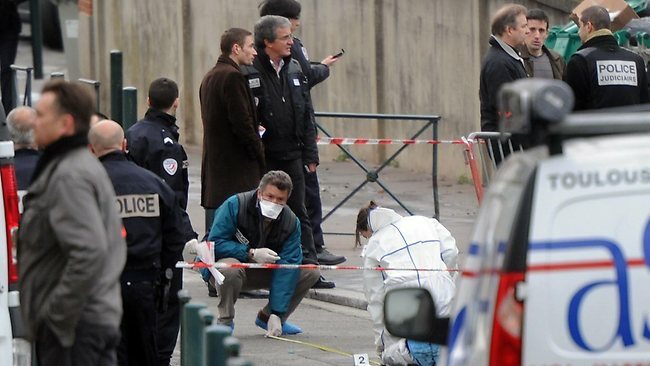 Police have said the .45 calibre weapon fired on Monday was the same as the gun used to kill the three soldiers in Toulouse and Montauban. Socialist leader Francois Hollande also cancelled his campaigning engagements for next month’s presidential election in order to travel to Toulouse. “You cannot murder children like this on the territory of the Republic [France] without being held to account,” Francois Hollande said. President Nicolas Sarkozy echoed the comments of other French officials when he said he was “struck by the similarities” of the recent attacks, but he warned against jumping to conclusions. Israeli Prime Minister Benjamin Netanyahu called it “a loathsome murder of Jews, which included small children” and said an anti-Semitic motive could not be ruled out. The Vatican also condemned the killings, as did French far-right leader Marine Le Pen, who called on the authorities to do everything to prevent another such attack. Monday’s shooting was the deadliest attack on Jews in France since a shooting in 1982 at a restaurant in Paris, when six people were killed and 22 injured.